Demetrious Johnson is widely-considered the greatest mixed martial artist in the world, and he’s set to make his ONE Championship in less than a month’s time. Johnson’s promotional debut will take place on the historic ONE: A NEW ERA card on 31 March at the Ryogoku Kokugikan in Japan. While Johnson is aware of the current champion Adriano Moraes, and that’s the man he ultimately wants to face for the World Title, Johnson knows he must first handle his initial assignment. Johnson is a part of the highly-anticipated ONE Flyweight World Grand Prix. The winner will get a shot at the World Title. Johnson’s quarter-final matchup is against local hero, Yuya “Little Piranha” Wakamatsu. 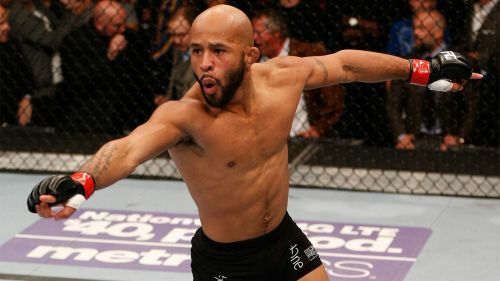 “Mighty Mouse” has already taken some time to get to know his opponent. Speaking to Forbes’ Brian Mazique, Johnson talked about some of the dangers in facing the 24-year-old Japanese product. “Wakamatsu comes from a great camp. He likes to use his right hand,” Johnson said. Johnson will be a heavy favorite when he takes on Wakamatsu, though both men are coming off defeats in their last bouts. Wakamatsu has far less experience, and he hasn’t accomplished anything close to what Johnson has in his illustrious career. That said, Johnson hasn’t competed in eight months. He talked about why the extended layoff was necessary after his last bout, a loss to Henry Cejudo that cost him his flyweight title. “It’s part of mixed martial arts. As you get older, you don’t recover like you used to. In my last fight, I had some medical issues, and some things I needed to take care of before my next competition,” Johnson said. With Johnson having accomplished so much, how does he guard against overconfidence heading into a battle with a less-established opponent? “I train with the best. My coach Matt Hume, he’s no joke. He keeps me from being overconfident and people who know me know that I’ve never been the type to be confident. So I just stay humble, give it my all and see what happens,” Johnson added. This approach has clearly been working for Johnson. He’ll climb into the cage with Wakamatsu with a record of 27-3-1. Prior to his controversial defeat in his last bout, Johnson had won 13 consecutive bouts. It was an undefeated streak that lasted more than six years. At the age of 32, Johnson may not want to compete another six years, but it will be fascinating to watch what he can accomplish in this next stage of his career with ONE Championship. Along with Johnson’s promotional debut against Wakamatsu, ONE: A NEW ERA will also feature four World Title bouts and the ONE debut of Eddie Alvarez. He too is a former World Champion, two times over, and he’s also the man who helped kick off the wave of American mixed martial artists who made their way to ONE. With such a stacked card, fans of martial arts should be treated to a memorable night of combat sports. Obviously, not least of which is Johnson’s first opportunity to show ONE what he’s capable of firsthand.